My family — the Warnocks — are of Scots-Irish ancestry. According to family legend, we left Scotland and arrived in Ireland just in time for the Irish potato famine. Call it bad timing, I suppose, but from that difficult experience three Warnock brothers came from Ireland to America in the mid-nineteenth century. Apparently the original family name was McIlvernock, indicating a native Scottish origin. But over the generations, the McIl was dropped and Vernock became Warnock, so by the time the Warnock brothers came to America, their name no longer betrayed their heritage. My paternal grandmother’s family name suffered a similar modification. They were Irish — the O’Callahams — but, because of prejudice against the Irish in America, they dropped the O’ and became just the Callahams. An aunt relayed those stories about our lineage to me long years ago, and they stayed with me. She noted that when our Irish-immigrant ancestors arrived in the United States in the 19th century, prejudice against the Irish was at a fever pitch. When help wanted signs were posted in store windows many contained the caution, “No Irish Need Apply.” So much for the luck of the Irish. It seems the dominant majority in America has always designated one or more groups as an inferior group in our society. In the 19th century, ethnic epithets tagged each arriving immigrant people — Irish were “micks;” Germans were “krauts;” Italians were “wops;” Spaniards were “dagos;” and, I’m sure there were other groups that became tagged with similar expressions of bigotry. However, immigrants weren’t the only people who were labeled with derisive nicknames. Native Americans were referred to as “savages” or “redskins.” Sports teams like the Washington Redskins, Cleveland Indians, and the Atlanta Braves receive continuing, and I think justified, criticism for using nicknames and images which Native Americans find offensive. Of course, the ultimate prejudicial identifier used by whites of African Americans is what we now refer to as the “n-word” because its use is socially offensive in public discourse. In 21st century America, immigrants have become the new target of group prejudice, regardless of country of origin. Hopefully, we who are third-or-more generation Americans will remember that unless we are of Native American ancestry, our forebears who came to this country were also immigrants. Group prejudice targets whole segments of population based on country of origin, but that is not the only criteria for group prejudice that exists. We also harbor prejudice against other groups for other reasons in this nation. In part, the recent activism of the “new atheists” was to counter the prejudice directed at atheists and agnostics as a group simply because they do not believe in the god to which most of society pays lip service. Of course, groups who do believe can also become the targets of prejudice, such as Mormons who were hounded out of Ohio in the 19th century, but who eventually found a home in the Great Salt Lake area. Mitt Romney’s candidacy helped to dispel the use of religious prejudice as a political weapon, but prejudice against religious groups still exists. Now, we as a society are grappling with the issue of gay marriage. In doing so, we are having to confront our own prejudices against another group, the gay community. This group also has been the target of derogatory name-calling. Until the activist gay community adopted the term, “queer” was a widely-accepted heterosexual descriptor for homosexual men. Of course, many evangelicals have described their ambivalent attitude toward gays with the phrase, “we hate the sin, but love the sinner.” We are now hearing that this is not comforting or encouraging to the gay community. They do not want to be referred to as “sinners” because they see nothing wrong with who they are. Behind the idea of homosexuality as sin is the long-held evangelical belief that homosexuality is a choice, and not genetically determined. Therefore, the argument goes, those who choose homosexuality are choosing to sin. Clearly, this understanding is being challenged in our society today. How evangelicals will evolve on this issue is still up for grabs, but I believe that prejudice against homosexuals as a group eventually will become socially unacceptable, just as prejudice against other groups has also become socially unacceptable. Does that mean that churches cannot set their own criteria for participating members, including conduct based on the Bible’s ethical principles? Absolutely not, but personally, I have become more wary of prejudice against whole groups of people than I used to be. Anytime we lump all members of any group into the same pot, let’s remember that not all Christians (or Muslims or Jews or Buddhists) believe exactly the same, not all Irish are hot-tempered, not all Asians are inscrutable, not all Italians are good cooks, and not all Germans are analytical. Stereotypical group characterization does not make our society better, lead to more understanding, or foster dialogue. Perhaps one day we will no longer see the need to denigrate another group of people in order to feel good about ourselves. I’m preaching from Luke 4:1-13 on this first Sunday of Lent. The story of Jesus in the wilderness packs lots of significance and symbol for us to reflect upon during these next weeks leading to Easter. I trust that you will have a wonderful Sunday worship experience today as we begin our journey toward the cross and the empty tomb. 1Jesus, full of the Holy Spirit, left the Jordan and was led by the Spirit into the wilderness,2 where for forty days he was tempted by the devil. He ate nothing during those days, and at the end of them he was hungry. Today marks the first Sunday in the season of Lent. As you know, the Lenten season comes in the forty days preceding Easter, not counting Sundays, so Lent actually lasts about 46 or so days. Usually, when we think of Lent we think of a time for reflection, a time to consider the life and ministry of Jesus that led him to the cross and to the victory of the empty tomb. Typically, when we think of Lent, the event in the life of Christ that is representative of this season is the passage we read today — Jesus in the wilderness. In this passage we have all the classic signs and symbols of focusing on God. First, there is the period of time — forty days. The number 40, while it certainly can be a literal number, has a greater theological significance. The number 40 indicates a sufficient time, a time when what needs to be completed can be completed. It is a time that extends beyond the ways in which humans keep time. It is longer than a lunar month, and so represents another way of keeping time, a way of keeping time that accommodates the plans and purposes of God. For example, Moses spends 40 days and 40 nights on Mount Sinai in the presence of God. The nation of Israel, after its disobedient refusal to enter the Land of Promise, wanders for 40 years in the desert until the unfaithful generation has all died out. The prophet Elijah retreats for 40 days after his encounter with the prophets of Baal and threats by queen Jezebel. In the past few years, a spate of books have been published which emphasize a 40-day period of study. But, 40 days or years isn’t a magic number, or even a number that is somehow more adequate for study and reflection. Forty days represents the time needed for God to fulfill his purposes. It’s God’s time, not ours, and during this new way of counting time, God is at work. Jesus, full of the Holy Spirit, left the Jordan and was led by the Spirit into the wilderness,2 where for forty days he was tempted by the devil. He ate nothing during those days, and at the end of them he was hungry. We know God is at work here in Jesus’ life because Luke places the Spirit of God front and center in this particular event. Jesus is full of the Spirit, and led by the Spirit into the wilderness. God is at work here, and the time for God’s work is measured in a different kind of time, a time that Luke says takes 40 days. The second sign and symbol is that this work of God takes place, not in a town or city, not in a synagogue or even the Temple itself. If 40 days or years marks a new way of understanding time, then the wilderness symbolizes a new place to encounter God for Jews in the 1st century. We have a hard time truly understanding the significance of the Temple in Jerusalem. This massive structure that dominated the skyline and physical boundaries of the city of Jerusalem was thought to be the place where heaven met earth, where God dwelled among humankind. God was resident in the Holy of Holies, God’s presence was assumed and revered by righteous worshippers. Only on one day of the year, Yom Kippur, did anyone enter the Holy of Holies to encounter the presence of God. But the wilderness has a long and marvelous history of being the place where God is found. Wilderness has always been a place of seclusion, of revelation, and of danger. Moses encounters God in the burning bush in the backside of the desert, and it is that encounter which sets the stage for the rest of the history of Israel and the world. The wilderness is where the Law of God is given, where prophets retreat to find God again, where God sends the last Old Testament prophet, John the Baptist to preach and baptize. When John the Baptist establishes his preaching and ministry of baptism in the wilderness near the Jordan River, John is speaking a rebuke to the Temple in Jerusalem, to the sacrificial system, and to the corruption of the religious leaders and sects who control access to God, and who set the acceptable ways in which God can be obeyed. John the Baptist wasn’t in the wilderness because he wore animal skin and ate a strange diet of locusts and wild honey. John the Baptist was in the wilderness as sign and symbol that God was doing something new, stripping away the old systems of religious habit, and calling his people to a new life of obedience. So, Jesus is led by the Spirit into the wilderness. Mark’s Gospel dramatically says Jesus is thrust into the wilderness by the Spirit. God is up to something, and the wilderness, in all its stark devastation is the place where Jesus is to meet God, his Father. N. T. Wright believes that Luke is offering a parallel between the life of David, the most revered king in Israel’s history, and the life of Jesus. After David is anointed by Samuel, while Saul is still king, David goes to fight the giant Goliath. After Jesus is baptized by John, and receives the anointing of the Holy Spirit as the Spirit descends upon him and God’s voice declares “this is my Son in whom I am well-pleased,” Jesus goes immediately into the wilderness to face the adversary, satan or the devil. Wright sees other parallels as well, but if that is the case, Jesus’ wilderness experience places him in the legacy of King David, not only biologically, but also spiritually. Often when we read this passage, or the account in Matthew’s Gospel, we tend to zoom in on the temptations of Jesus, and then seek to apply them to ourselves. But, I’m going to suggest today that we zoom out, and look at the temptations of Jesus in a new light. While it is true that these temptations are given for our benefit, or else they would not be in Scripture, if we stand too close to them, and reduce them to moral do’s and don’ts, we miss the greater message. There are three temptations or tests that we are told Jesus encounters toward the end of his 40 days in the wilderness. We can only assume that the bulk of the 40 days is spent in prayer and fasting, but we also know that Satan is working on Jesus all during that time. I think its interesting that the only way we know this story is because Jesus must have told it to the disciples himself. And while 40 days is a long time, and fasting for that long is a spiritual feat in itself, the part that Jesus chooses to tell the disciples focuses on the end of the experience, and the choice Jesus makes. In my estimation, the temptations of Jesus highlight the contrast and conflict between this world, and the Kingdom of God which Jesus is about to announce and begin to usher in. Of course, Jesus is the Son of God, and of course he does possess the power to turn stones into bread — after all he turns water into wine, and multiplies bread and fish. But the contrast between this world system and the Kingdom of God is this — who do you trust for your daily provision? When Jesus quotes Scripture back to Satan, he recalls the Exodus experience, and the fear of the Israelites that they would starve in the desert. They want to go back to Egypt because at least they had food to eat. Israel would have traded freedom for food, affirming that the power of Pharaoh was greater than the power of God. But Jesus quotes from Deuteronomy 8:3, where Moses is reminding the people of their history, their mistakes, and how they are to live in the future when they get to the Promised Land. And, what was the point of that? The point wasn’t that you don’t need food, or that reading the Bible is a good substitute for a meal. The point is who do you trust? Do you trust the lying, deceptive words of Pharaoh, or do you trust God to feed you? Do you trust what you know — food that you age in Egypt — or do you trust God to do something new if he needs to — provide manna — to feed you? This world, or God’s kingdom? That’s the point of the first temptation. Jesus echoes this in the Sermon on the Mount when he describes what life is like in the Kingdom of God. “Blessed are those who hunger and thirst for righteousness for they will be filled.” (Matt 5:6 NIV). But, Jesus reiterates this point of trusting God’s ways for material provision later in the Sermon on the Mount. In Matthew 6:11, Jesus teaches us to ask God to “Give us this day our daily bread.” And, he then encourages us not to worry about having enough to eat or wear, not because its not important, but because in God’s Kingdom, God provides for everything, even the flowers and the birds. The second temptation raises the level of conflict, and gets right to the point. So, no more subtleties from Satan. In this temptation, Satan cuts right to the heart of the matter. If you have ever traveled in the southeastern United States, you have no doubt seen signs painted on barns and billboards that say, “See Rock City.” Rock City, located near Lookout Mountain close to Chattanooga, Tennessee, is a roadside tourist stop that capitalized on the natural rock formations typical of that part of the state. In addition to the rock formations, and the additions of not-so-natural-features like miniature golf, Rock City touted its magnificent views. “See Seven States From Rock City” was the message plastered all over the southeastern US. And, on a clear day, you can. Well, I always think of seeing seven states from Rock City when I read this passage in Luke. Satan takes Jesus up on a high place — we don’t know where — and Luke says, “shows him in an instant all the kingdoms of the world.” Pretty good view, but I think something else is at work here, too. Then Satan offers all he sees to Jesus, if Jesus will worship him. And, that brings us back to our conflict between this world and the kingdom of God. Now a lot has been written about whether or not Satan really could have delivered the kingdoms of this world to Jesus. Of course, Satan is a liar and a deceiver, so there is the real possibility here that he’s blowing smoke. And considering where he came from, he may literally have been blowing smoke. The promise Satan makes, whether he could deliver or not, is an empty promise based on temporal authority. Of course, read any newspaper or watch any network news program and you will see daily the scramble for power and authority. From politicians to bloggers, everyone wants to be noticed, to be powerful within their own sphere of influence, and to be able to exert that influence for personal benefit. But the Kingdom of God talks about things like the “last shall be first” and the “peacemakers will be called the children of God.” Jesus knows there is no shortcut to glory, no easy way to claim his rightful place as King of kings and Lord of lords. The only way is the way of the cross, and Jesus chooses that instead of the power and glory of this world. Finally, the last temptation is one last futile attempt to call into question the character of God. Satan dares Jesus to throw himself down from the highest point of the Temple, because God will send his angels to save him. Jesus’ reply is “Don’t put God to the test.” You either trust God or you don’t, you either believe what God says or you don’t, you either give you life and all you are to God or you don’t. And if you don’t cheap displays of pointless power will not sway one individual. After all, Jesus, in the story of the rich man and Lazarus, said that even if someone comes back from the dead, they wouldn’t believe him. Which is of course, what happened when God raised Jesus from the dead. During these next 40 days, our time in the wilderness is a time to reflect on our own choices. Are we choosing the kingdom of God, or the kingdoms of this world. Do we trust the provision of God, or the frantic consumer culture in which we live? Do we live by Kingdom values, which are not the values of power and might projected by governments and politicians? Jesus was tempted for two reasons, I think. First, so that he could become the representation of righteous Israel. In every temptation Jesus faced, Israel had already faced them and failed. In the manna in the desert, the quest for kingdom power, and the failure to trust God, Israel had failed almost every test she had been given. When Jesus resists Satan and affirms his faithfulness to the Kingdom of God, Jesus becomes the representative of all of God’s people. This will give him the right to die for the sins of all God’s people on the cross. But, Jesus was also tempted to demonstrate that we can choose the Kingdom of God over the kingdoms of this world. In order to proclaim God’s Kingdom, Jesus had to choose it. If we are to proclaim God’s kingdom, we too must choose it. We must make a conscious choice to live our lives differently, with different values, than the current world system. That’s what our time in the wilderness is about. The only question is, what choice will we make? Dr. Sun* of Yunnan province in China made his choice. The son of a doctor and hospital administrator, Dr. Sun survived the Cultural Revolution in China, and in 1977 was admitted to Beijing Medical University. He obtained his MD degree in 1982, and joined the staff of a hospital in Suzhou. Dr. Sun’s skill as a surgeon, and is concern for helping patients quickly elevated him to the role of hospital administrator. The Communist Party bosses in Suzhou saw Dr. Sun as a promising young physician. They awarded him a car for his own use, and all the perks that went with his position. However, Dr. Sun was more interested in helping patients than in enriching himself. He told the local political leaders to sell the Volkswagen Santana he had been given, and to give the money to help the hospital. Dr. Sun rode his bike to work each day afterward. Dr. Sun also disrupted the cozy relationship between Chinese hospitals and Chinese pharmaceutical firms. Cheap medicines are available in China, but even in the 1980s, doctors and hospitals would prescribe the more expensive medicines, and charge exorbitant fees for their services. Dr. Sun drew the unwanted attention of local political leaders who also benefited from the arrangement. In 1990, disenchanted with the China’s communist government and its failures to actually help medical patients, and seeking direction for his own life, Dr. Sun attended a prayer service with several of his medical school students. A year later, at a Christmas service in a Chinese Christian’s home, Dr. Sun said he “felt his heart touche in a way it had never been touched before.” He was soon baptized. In 1997, Dr. Sun’s boss presented him with an application to join the Communist Party. A membership in the Chinese Communist Party was the first step in becoming one of China’s elite leaders in his field. However, Dr. Sun told his boss he could not fill out the application. Banned from working in government hospitals, Dr. Sun worked in Thailand for a while. But on a return trip to China in 1999, Dr. Sun met a former student of his. The student told him of a very sick woman in a remote village from the student’s own province. The next day he showed up to take Dr. Sun there. For the next 10 years, until 2009, Dr. Sun served quietly and without pay, providing medical care for people in the remote areas of Yunnan province. Often, villagers would not be able to pay anything for their treatment, but fed Dr. Sun, and gave him a place to stay in their homes. Donated clothes, and the financial support of other doctors and Christians allowed Dr. Sun to continue his work until 2009. Finally, Chinese authorities accused Dr. Sun of having subversive motives, and banned his medical practice from Yunnan province. Dr. Sun was invited to the United States by a Chinese Church to tell about his medical ministry, but the government of China refused him re-entry. Dr. Sun lives in California today, where he is planning to replicate his medical ministry in Africa. Dr. Sun made his choice. What choices do we make? *Dr. Sun’s story from God is Red: The Secret Story of How Christianity Survived and Flourished in Communist China, by Liao Yiwu. Published by HarperOne, 2011. New lift makes our sanctuary accessible to those with mobility difficulties. 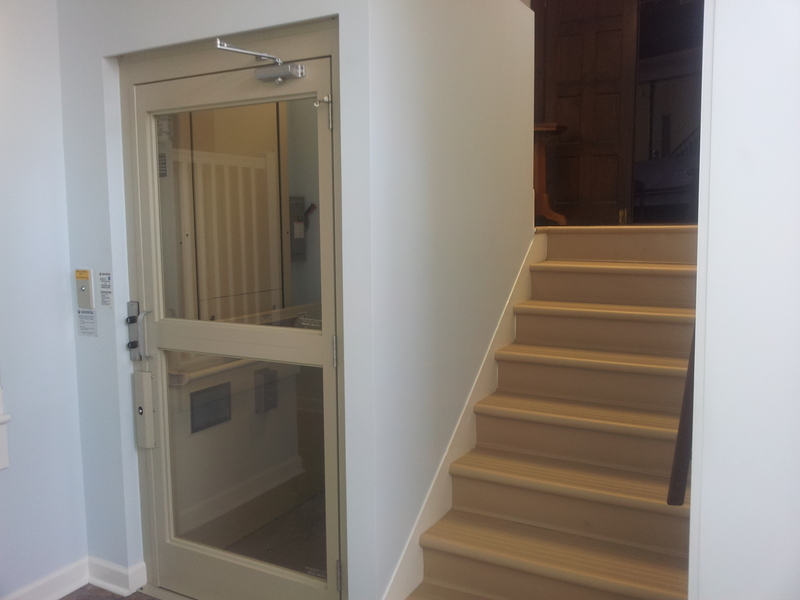 Our church recently installed a lift at the entrance from our educational/office building into the sanctuary. This is the entrance to the sanctuary most of our members use on Sunday mornings, especially if they attend Sunday School. Although we have a wheelchair ramp at the front entrance of the church, and an elevator at the rear entrance, the 7-steps between the ed building and the sanctuary posed a barrier to those in wheelchairs or those unable to climb stairs easily. 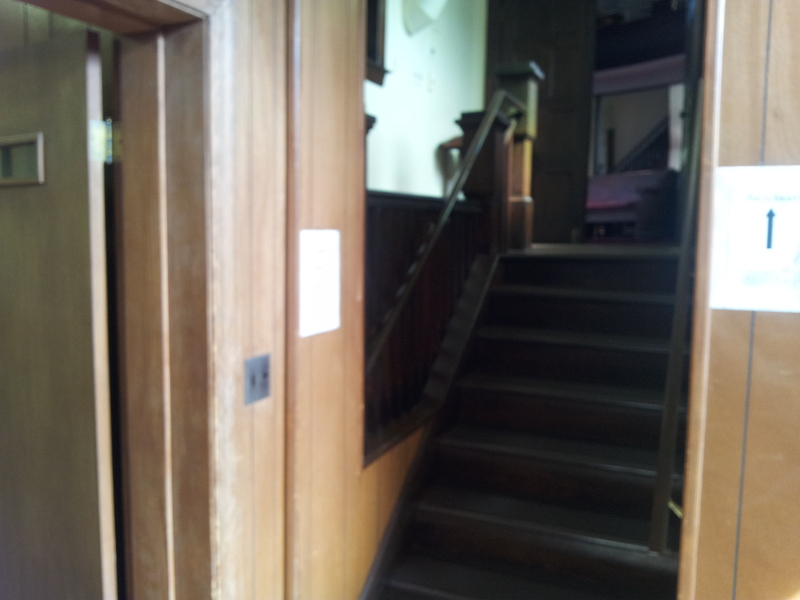 Entrance to the sanctuary before remodeling to install the new lift. well in advance of that. Our church is now 100% compliant with the Americans With Disabilities Act, and all buildings and restrooms are equipped appropriately for wheelchair accessibility. For us, doing the work necessary to welcome all persons regardless of their mobility issues was important for our ministry to the community. What challenges is your church facing in welcoming and accommodating persons with mobility issues? Sermon: When God Does The Unexpected, How Do We Respond? 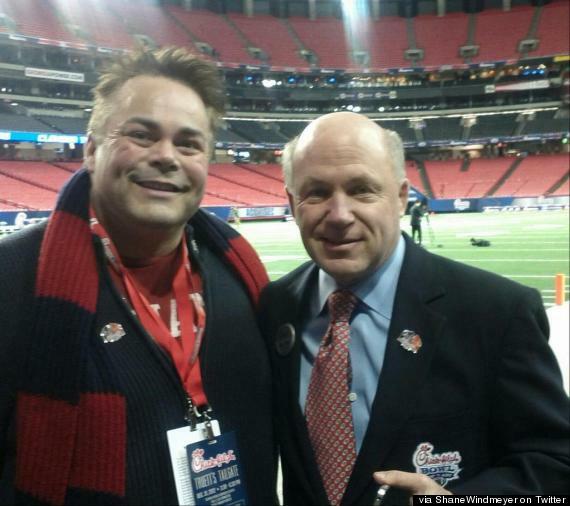 Shane Windmeyer and Dan Cathy at the Chick-Fil-A Bowl. This is the sermon I’m preaching tomorrow, February 3, 2013. If you don’t read the whole sermon, skip to the end for a great story of Dan Cathy, CEO of Chick-Fil-A, and of how he responded to the unexpected that God was doing. I hope you have a wonderful day tomorrow. When God Does the Unexpected, How Do We Respond? According to Luke’s Gospel, Jesus had just returned from 40-days in the wilderness, following his baptism by John the Baptist. Generally, Bible scholars regard the wilderness experience as Jesus’ preparation for his ministry. We do not know how many days or weeks elapse between Jesus returning to Galilee and his trip to his hometown in Nazareth, but enough time passes so that Jesus has ample opportunity to establish his own reputation as a healer and miracle worker. Luke tells us that “news about him spread through the whole countryside” which can only mean that he immediately begins to announce the Kingdom of God and demonstrate its presence by healing the sick, casting out demons, and generally “putting to rights” (as N. T. Wright is fond of saying) each situation he finds. Of course, this garners him an extraordinary reputation, and everyone is talking about Jesus. So, when Jesus shows up in his hometown of Nazareth, initially everything goes okay. Jesus comes to the synagogue there, which probably is a modest building since Nazareth is no metropolis itself, and someone hands him the scroll of Isaiah to read. Apparently Jesus selects the text, which is Isaiah 61:1-2 in our Bibles. If you turn to Isaiah 61:1-2, you will notice that it reads somewhat differently than the words Luke records Jesus as reading. Don’t be alarmed at that because Luke quotes Jesus reading from the Septuagint, which was a Greek translation of the Hebrew Scripture. But, the slight difference in wording is not our concern today. The point Jesus makes is this — He is the Messiah! That’s what the phrase “He has anointed me..” means. The Hebrew word which we pronounce messiah meant “anointed.” There were only two offices for which as person was anointed in the Old Testament — the office of priest and the office of king. But the idea of an “anointed one” who would restore the fortunes of Israel also is referred to by the prophets, and Isaiah especially. The Anointed One — the Messiah or in Greek, the Christ — would be God’s deliverer, just like the Judges of the Old Testament were raised up to deliver Israel. But the Messiah would not be just any deliverer to put Israel back on track temporarily. No, the Messiah would come once and for all to make all things right and restore the fortunes of Israel and her standing in the world. In other words, God would send the Messiah to vindicate Israel and to save her from her enemies, and put all other nations under her ruling power. Do you begin to see what Isaiah 61 is about? Not only is God going to raise up someone and anoint him to “preach good news to the poor,” but God is going to raise up this Messiah who will 1) comfort the nation of Israel, 2) restore her fortunes, and 3) judge other nations and give Israel their riches, lands, and make Israel their master. That was how many first century Jews interpreted Isaiah 61. Whoever read Isaiah 61 would immediately know that God was coming to rescue Israel by sending the Anointed One, and that in that rescue all the other nations of the world would be subjected to her. Now, let me point out that that interpretation was in error, but that did not stop an occupied Jewish people facing the hardships of over 60 years of Roman occupation from understanding Isaiah in that way. At this point, Jesus has them eating out of the palm of his hand. And, if he had quit at this point and sat down, all the men of Nazareth would have crowded around him, slapped him on the back, and told him how proud they were of him. But Jesus is having none of that. He is not here to prove himself, but to tell them that what they expected God to do isn’t going to happen. Jesus is there to tell them that what they have talked about for generations, the way they have interpreted Scripture, the expectation that God will deliver Israel first and make her the ruler of all other nations is all wrong. And, to prove his point, Jesus uses two stories from Elijah and Elisha — two prophets who stand in high esteem. The return of Elijah is thought by first century Jews to precede the coming of the Messiah, and so they set a place at the Passover Table for Elijah each year. John the Baptist is thought by some to be the second-coming of Elijah. And, as we will see next week, Elijah does come and appears with Moses and Jesus at the Transfiguration. Elisha is Elijah’s protege, and Elisha receives a double portion of Elijah’s spirit when Elijah is taken into heaven in a chariot of fire. So, Jesus uses these stories because they have weight and importance. The first story is the story of a widow who Elijah befriends. When Elijah finds out that this poor widow is going to use the last of the flour and oil she has to make some bread so that she and her son may eat it and then prepare to die, Elijah promises her that the oil will not run out, and the flour will not be depleted as along as she is helping him. Great story, and it was one of my favorites as a young Junior boy. In other words, Elijah helped a widow and her son who were not even Jews. And this during a famine in which many Jews suffered and died. Sidon is a region to the far northwest of Israel, and Zarephath was probably a Canaanite or Phoenician village. In other words, during the worst drought Israel had ever seen, God’s man Elijah helped a poor Sidonian widow, despite the fact that there were thousands of Israelite widows suffering, too. But, Jesus doesn’t leave the story there. He uses another story, this time from Elisha’s prophetic ministry. The story of Namaan is another great story that I loved as a boy. Namaan is the general of the Syrian army. In his conquest, he captured an Israelite girl who is now a servant in his household. Namaan contracts some kind of skin disease which the Bible calls leprosy, although we know now that the term was used for a wide variety of skin afflictions. Nevertheless, whatever Namaan had was serious, was not getting better, and Namaan was desperate for a cure. The servant girl implores him to seek out Elisha because she knows Elisha has the power to heal him. So, after contacting the king of Israel who thinks this is all a trick, Elisha hears and invites Namaan to come to his house. Namaan appears with with horses and chariots at Elisha’s house and Elisha doesn’t even come out. Instead, he sends word for Namaan to go and dip himself 7 times — a very biblical numer — in the Jordan River. Namaan is furious and goes off in a huff. His servants remind him that if Elisha had asked him to do something difficult, he would have done it. So why not do something as easy as dipping yourself in the Jordan River? Of course, Namaan does, he’s healed, and he worships God as the one true God. But Jesus point in the story of the widow of Sidon and the story of Namaan the enemy general is that God passed over a lot of Israelites who were in just as bad, if not worse, condition. Only God provided oil and flour for the widow, and healed the leprous Namaan. Both were strangers, both were not Israelites, but both were saved by God. And so, Luke says the men were furious, tried to grab Jesus and throw him over a cliff, but somehow he eluded them and escaped. So, when a young cobbler says that God wants the Gospel preached to foreigners in India, William Carey is ridiculed by his fellow preachers because they’re sure “that God doesn’t need” Carey’s help. And when a young Hudson Taylor believed that God wants the Gospel preached to those in China, others ridicule him, too. Of course, we now know that millions of people in countries other than England have come to Christ from the modern missions movement that Carey and Judson and others like them started. God was indeed doing the unexpected. The ensuing controversy, which appears to have taken Mr. Cathy’s words out of context, made national headlines. Mike Huckabee, Fox News commentator and former Baptist pastor and governor of Arkansas, declared August 1 of last year, “Chick-Fil-A Appreciation Day.” News media reported that business was brisk that day at Chick-Fil-As all over the country. But Dan Cathy wasn’t pleased with the tone the unwanted controversy had generated. One of Chick-Fil-A’s corporate values is “respect” for all persons, including those who are gay. Dan got the cell phone number of a gay activist, Shane Windmeyer, director of Campus Pride, and called Shane to open a dialogue. After several phone calls and face-to-face meetings, Campus Pride called off its boycott of Chick-Fil-A citing the conversations with Dan Cathy and other Chick-Fil-A executives as the reason. But Dan Cathy didn’t stop there. He invited Shane Windmeyer to join him and his family on the field for the Chick-Fil-A Bowl. Shane Windmeyer said Dan Cathy spent the entire evening at the Chick-Fil-A Bowl with him, there on the sidelines. In an article on Huffington Post, Shane Windmeyer reflected on the experience of getting to know Dan Cathy, the CEO of Chick-Fil-A. That is a great example of how to respond when God is doing the unexpected. When God is inviting people we may have thought excluded from the Kingdom of God into it, do we react the way the men at the synagogue in Nazareth reacted — with anger that our cherished beliefs that God will choose us first are being challenged? Or do we respond the way Dan Cathy did — with love toward those we do not know, but wish to understand better. Today we gather around the Table of Christ, and we must know that this is not our table. While we laid the bread and cup here today, we did not suffer and die to give these elements meaning. As we gather here this morning, we remember the words of Jesus — “Today this Scripture is fulfilled in your hearing.” The only question is, how do we respond when God does the unexpected?